Description: The expressions for definition of a value of a signal oise ratio in combined codes of transforms of discrete cosine conversion are output by transmission on a data link. Thus the various weight of the errors which have arisen in the auxiliary and information parts of code patterns is taken into account. Korolev, A.V. 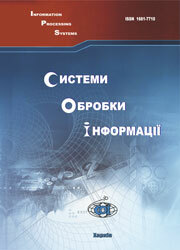 (2002), “Otsenka pomekhoustoichivosti kombinirovannykh kodov transformant”, Information Processing Systems, Vol. 5(21), pp. 3-9.